ClickDimensions is an email marketing and marketing automation solution for Microsoft Dynamics CRM. ClickDimensions offers web intelligence, lead scoring, form capture and more. 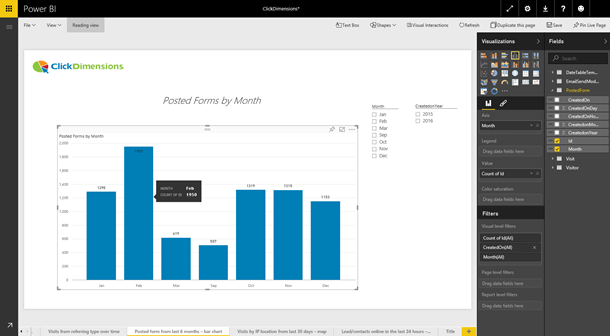 The Power BI content pack provides insight into marketing and sales efforts, focusing on visits, email sends and posted forms. This post will explain how the Power BI content pack can help you analyze your ClickDimensions data. 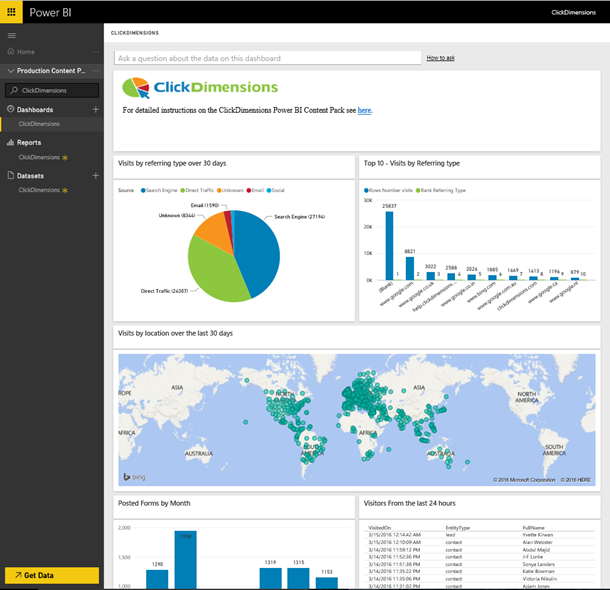 For additional details on how to get started, please see the ClickDimensions content pack for Power BI help page. Once the connection is completed, Power BI will automatically create a dashboard, report and dataset with data from your ClickDimensions account. The dashboard tiles have a variety of insights on visits and posted forms. Select any of the tiles to drill into the multiple pages of reports behind the dashboard. For example, select the Visits by Location map tile to open the detailed report page. This report shows the visits by IP location for the last 30 days. The report allows you to hover over the visualization to see additional details and a set of slicers on the right to focus in on a particular section. In each report you can switch to edit mode where you can edit or add additional visuals to your reports. On the right, you’ll see a list of all the tables and fields you have access to in the content pack. From any of the reports you can pin the visualizations or tiles to the dashboard by hovering over it and selecting the pin icon. Pinning the visuals will prompt you to select a dashboard to pin to, allowing you to customize your analytics even further. After the initial import, the dashboard and the reports continue to update daily. You can control the refresh schedule on the dataset. 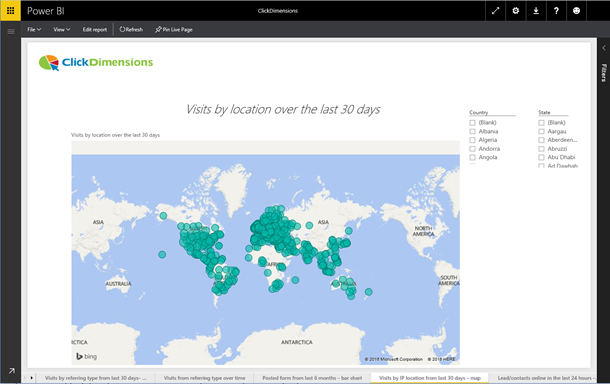 With the ClickDimensions content packs for Power BI, you have a set of insights that you can use to explore your data even further.